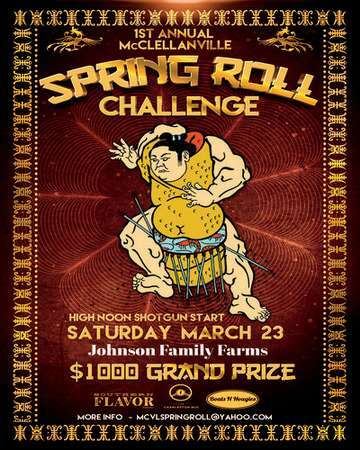 Boats and Hoagies and The Charleston Bus are proud to announce The 1st Annual McClellanville Spring Roll Challenge at Johnson Family Farms brought to you by Southern Flair Magazine! Come roll in the first weekend of Spring with us in the beautiful surroundings of Johnson Family Farms. Visit "Vendortown" to shop local wares, art, produce and other treats from local McClellanville and Charleston artisans. Find your way under the barn for the 1st ever Spring Roll Challenge! Be a participant and take a chance at rolling out with $1000.00!! HIGH NOON SHOTGUN START! Email for participation rules! Make your way thru our maze of fun family games like Sumo Suit Wrestling, The Great Keg Roll, Whack-a-Mole, Mini Hoops, Putt Putt, and Skee-ball! Each game will be sponsored by a local business. What will you win? Email us if interested in a sponsorship package.